Innovation birthed from innovation — the Tournament Cable EZ/6 Dredge is our second generation collapsible dredge, and by far the superior product. While the Tournament Cable Tech Dredge was remarkable in its own right, we took the entire design back to the drawing board to bring you a product simply unmatched by anything on the market. Precision machined right here in the USA, the Tournament Cable EZ/6 Dredge features spring stainless arms in an interlocking disc hub, and a standard of quality you will not find anywhere else. The entire dredge collapses down to its radius, yet when locked open fishes with the stability and strength of a fixed dredge. 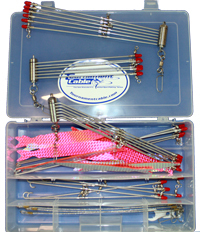 An entire triple tier dredge can fit in a tackle drawer or box, and a full dredge rigged with natural baits can be folded up and stowed right in the cooler. The arms of the EZ/6 are easily changed, and can be replaced on the boat as needed… no need to send the dredge back to the manufacturer - all you need is a pair of pliers and arms can be replaced within minutes with no special tools required.